When I moved this summer from an apartment to a house I was actually moving to a smaller space: my house, you see, is Thumbelina-size and quite a bit smaller than the apartment I moved from. I love my new house but I need to find ways to make the small space work for me. I have lived in it for almost three months but I have put off doing any work to it until after Christmas. Procrastination is in this instance, I think, a good idea and chimes with the oft given advice that it is best to accustom yourself to a space before launching into changing it. Not that I am planing on making major changes but I know that I need to – improve the insulation and replace the energy-guzzling and none too pretty storage heaters. These two items are in the must-be-done category as I am already feeling the cold in the evening and that’s before true winter weather sets in. The wish list is way longer: build in storage, revamp the bathroom, get new flooring, remove the embossed wallpaper and other fussy detailing, plaster over the stippled ceilings, update the lighting, replace the built-in wardrobes, install a word-burning stove and on and on it goes. As I said it’s a wish list. Naturally I am constrained by a budget and in this case that is a good thing as otherwise I might go wild and splatter, in a Jackson Pollock-esque fashion, total newness about my house. And as I may move again I am keeping in mind there is a limit to how much you can improve a standard house and expect to recoup even part of the costs of a revamp on resale. I am not at all put off by my place being small and, of course, I will do the usual things to make it seem bigger using: mirrors or other reflective surfaces, white wall to bounce the light around, and a limited colour palette. This week I moved to procrastination phase two when I bought a notebook: if in doubt I buy a notebook! Said notebook is for list making, writing up notes on or sticking in pictures of interiors that inspire me, drawing rough sketches, and listing the pros and cons of choosing to do one thing and not another. I hope the notebook will help me fashion some form from the fog of ideas in my head. I believe that things often become clearer and more likely to happen when they are written down. Just buying the note-book focused my mind and for now I am thinking that aside from the must-be-done items I will give priority to building in storage and removing most of the fussy detail in the house. That I suppose is a class of plan and hopefully I will come up with a proper one in the weeks to come. Thanks for your comment. I too love looking at before and after shots and at pictures of interiors in general. I will do a post when I do the work and will put up some before and after shots then. A couple of times in my life I’ve lived in tiny houses–and a few times I’ve live in very large houses. I find the small places “homier,” more personal, more in line with my life. But while I find them easier to live with, (once I’ve settled into them) I also find them more difficult to settle into than large spaces are. I can push a large space around, demand that it adapt to my vision and my personality. But in the end, living successfully with a small house depends upon my listening to it, as it tells me its personality, strengths, weaknesses and demands. That’s interesting that you preferred the smaller houses you lived in. I agree small spaces are ‘homier’ and I think that often in a larger space some or many of the rooms are used so seldom that they may not really be needed. Small space living is, I think, more of a challenge, but one I am looking forward to. 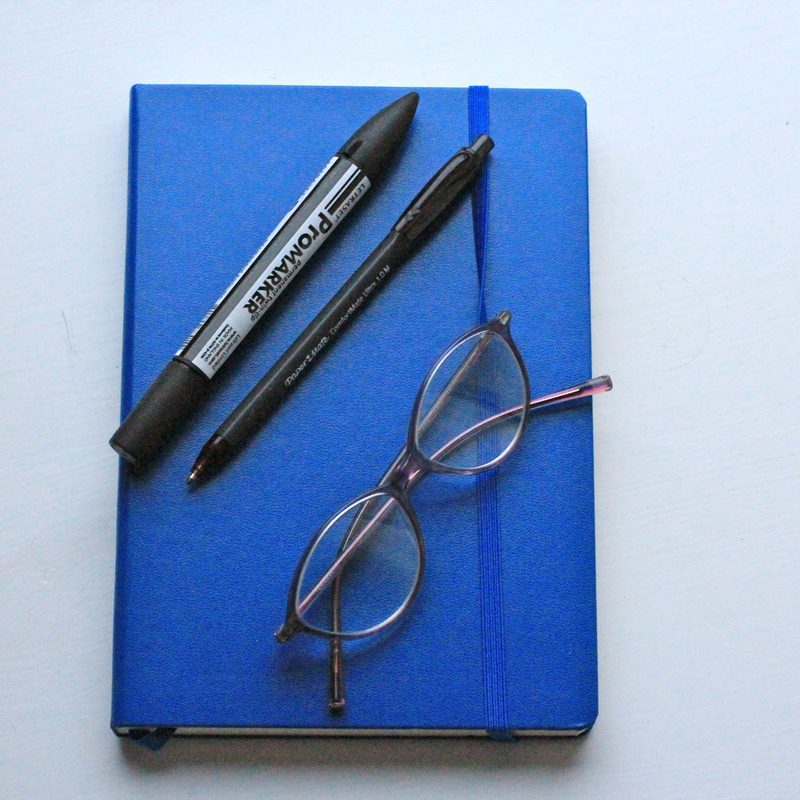 Buying a notebook, a beautiful blue one, at that, seems an excellent start 🙂 I have been watching http://www.channel4.com/programmes/george-clarkes-amazing-spaces with great interest because I am fascinated by small spaces. But my number one priority, whatever space I am in, is to be warm! I can’t bear being cold indoors; I am a softie. Happy planning. I agree with you about warmth in a home, it is very hard to enjoy a space if you are feeling cold in it. I too am fascinated by small spaces and their possibilities. When I moved to the apartment I lived in, before I moved to my new house, I bought lots of books on small space living as I was then also decanting my life into a smaller space, so I am looking through these at the moment in search of inspiration. Thanks for the link to the Chanel 4 programme. There will be lots of exciting possibilities but, as you say, budget is always an issue. Yes budget is an issue but that makes it more of a challenge which could be fun. Maybe! Are you a handy person who can sew and paint and restore? Gulp, me handy – no, sadly not at all. I can change a plug and apply paint and that’s about the limit of it. I agree you need to live somewhere awhile and get a feel for it. I’m looking forward to seeing how you add your personality to your home. Have you discovered Pinterest? An online virtual pin board – I found this very useful for collating ideas when planning my wedding. Of course it’s no replacement for a notebook which is accessible at all times but I had a lot of fun with it. I think adding your own stamp to a space is what we all seek to do, so I looking forward to making some changes. Yes I have discovered Pinterest but I have neglected it so thanks for the reminder. I am so curious about your house and hw you’re going to make it your place. I love the to-do list phase. I usually have like a billion ideas. Dear B, I know full well that major projects such as the one that would come out of your entire wish list may seem daunting and a challenge to put together into a coherent plan. And I think you are definitely on the right track as insulation is one of the key things in a house and in an apartment, as it definitely pays itself back in a short time in the form of energy savings. Yup, insulation is important – I need to find ways of making the house warmer. The weather here has been very mild for the time of the year but no doubt wintry weather will hit us sometime soon. Lists and writing things down works for me as it focuses my grasshopper mind and also gives me clarity around what’s important and what’s not. Thanks G. Yes, the embossed wallpaper has to go! Heading towards my latter years minus high heels but in stylish ballet flats. Just Add Attitude is my take on: life, style, food, interiors and so much more. If I could I would spend my life on a constant loop between my three favourite cities: Paris, London and my native Dublin. Funds don't permit such a version of perpetual motion, so I am content to visit Paris and London as often as I can. I often go to the lovely cafe at Airfield Estate for a coffee and to buy some of their delicious free range eggs. Airfield is a working farm in the Dublin suburb of Dundrum: going there often doesn't dim the wonder and the sense of the surreal I feel when I see farm animals in what's a busy built up area. Pretty containers of tulips on the terrace of Overends Kitchen - the cafe at Airfield urban farm. Ballymaloe House, a name that's synonymous with good modern Irish food. I didn't stay or eat there but I did have a delicious light lunch in their small cafe in the Ballymaloe Shop. Gulp! Christmas is less that ten days away. Christmas decorations are such a matter of personal taste. Here's a Christmas vignette I really like (seen at Hatch Coffee). The distressed wall behind it is super gorgeous. Throw back Thursday to a few weeks ago when I was in Florence. This is the beautiful entryway to the Officina Profumo-Farmecutica Di Santa Maria Novella. Founded by the Dominican Friars in the early 1220’s, it’s one of the oldest pharmacies in the world. The pharmacy is no longer owned and run by the friars. It’s now a contemporary business - but many of the lines it sells are made using centuries-old recipes. The pharmacy is a ‘must-see’ in Florence - the building is super gorgeous and the smells are divine. Sometimes judging a restaurant by its pavement appeal is a good idea. Sometimes not. I was initially attracted to this trattoria by the outside furniture - made from wooden wine boxes. The interior didn't disappoint and yesterday's lunch was also pretty good. There's lots to love about Hatch in Glasthule: excellent coffee, friendly service, and the gorgeous polished concrete floor. Dublin: as part of Culture Night 2017 the American author, Claire Messud, was interviewed at the dlr Lexicon. I took this picture on my way into the event. She was a captivating interviewee: funny, self deprecating, and charming. Shopping for flowers, earlier today, in Dublin's Fruit and Vegetable Market.